The Mulchman had business in downtown Seattle this past Monday, so I rode up with him in the car. He was happy to have the company and the opportunity to use the HOV lane. I was happy to spend three hours walking around downtown Seattle. My first stop was the new-ish Central Branch of the Seattle Public Library. This way-cool building was designed by Rem Koolhaus and opened about seven years ago. Its exterior is very unexpected, with diagonal grids on the faces and a squeezed middle section on several sides that's much narrower than the top or bottom of the building. You can see how that affects the interior in the shot above. The interior spaces are huge, yet the whole building is surprisingly friendly and useable. There's a coffee shop on the main level and light everywhere — enough for an interior garden. I think these plants were in pots under all that sphagnum moss, but the overall effect was pretty pleasing. The exterior landscaping was limited, although they had incorporated a runoff recovery system that stored rain to water parts of the grounds. But as I left the building I saw this striking variegated cedar(?) It looks like Cedrus deodora 'Cream Puff', but it was full-sized. When I looked closer, I could see that the new growth was all white and the individual side needles were all dark green. I wonder if the color contrast disappears gradually through summer and fall. After heading south to Pioneer Square, I walked north along the waterfront from there. It was bright, but there was a strong wind blowing and I was glad I had worn a jacket. Along a fenced area I found this lone Cistus flower in bloom. Winter had obviously gone easy on this shrub and it was making a break for downtown through the railing. My goal had been the Olympic Sculpture Park, but I stopped at Pier 64 when I realized it would take me a while to get back to our appointed meeting spot. An overpass there takes pedestrians over the rail lines and back into downtown. At the base of the overpass stairs was this small planting area with what looks to me like a Vireya Rhododendron. I thought they would be too tender to live outdoors, even in this somewhat protected spot. I loved the orange of its blossoms which complemented the mosaic on the stair walls beautifully. As I approached the building where I'd meet the Mulchman and a colleague we were transporting home, I spotted this simple but effective contrast. The pink and green of the Hellebore and the black of the Mondo grass were set off nicely by the gray aggregate wall. Three hours isn't much time in the city, but I would never miss an opportunity to explore our nearest big city neighbor. As it was, I got to cover a few miles on foot and I came home with a fresh perspective on a few plants and buildings in downtown Seattle. As an intern Master Gardener, part of my training includes 66 hours of hands-on work. Some of this work is "direct service", like staffing the MG clinic office phone or answering questions at a farmers market, the zoo, etc. Some of the service hours are considered "indirect". To satisfy the indirect hours I have been spending a few hours each Tuesday morning working at the Learning Gardens located at 60th and Duke in southeast Portland. Here's a shot of the Multnomah MG demo garden. Veteran Master Gardeners planned the bed contents earlier this year, and one serves as the Garden Guru to direct each day's activities. They, and we interns, do all the tasks required to keep the garden growing and productive, including sowing, transplanting, watering, weeding, mowing etc. 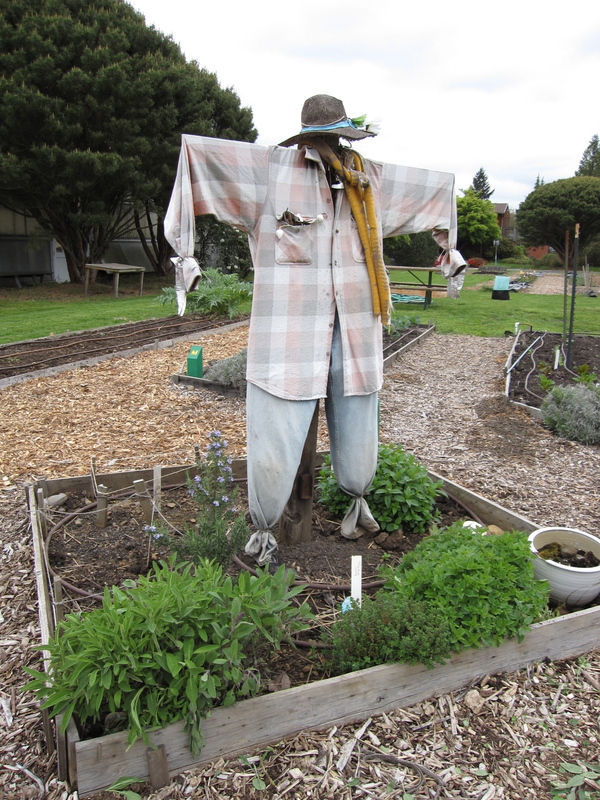 And an herb bed, complete with scarecrow. Right now, there's lots of lettuce and cool weather crop activity. Pok Choy is doing nicely after being transplanted out about three weeks ago. Featured for the first time this year is a Square Foot Garden. This is a system for intensive and successive planting in a very small area. 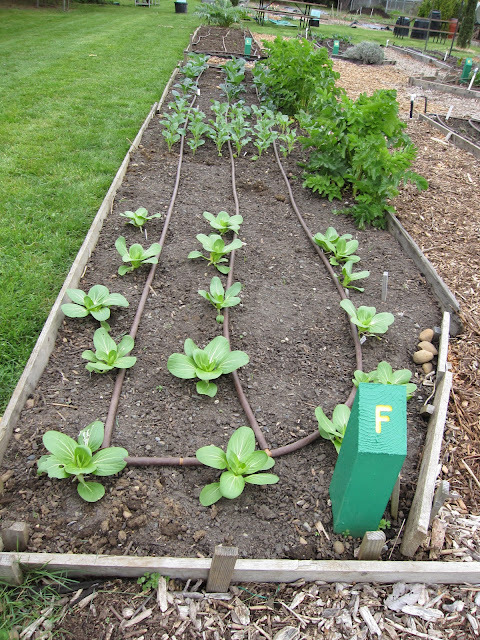 The raised bed has been divided into square foot sections and a specific number of seeds or seedlings are planted in each section. In just three weeks, the spinach, pok choy and lettuce seedlings have filled in, and the seeded radishes and carrots are sprouting. The rear third of the bed is reserved for something to be grown up a trellis later. This productive bed is only 8x3 feet, so it's a method that can work for people with only a small amount of land to garden. 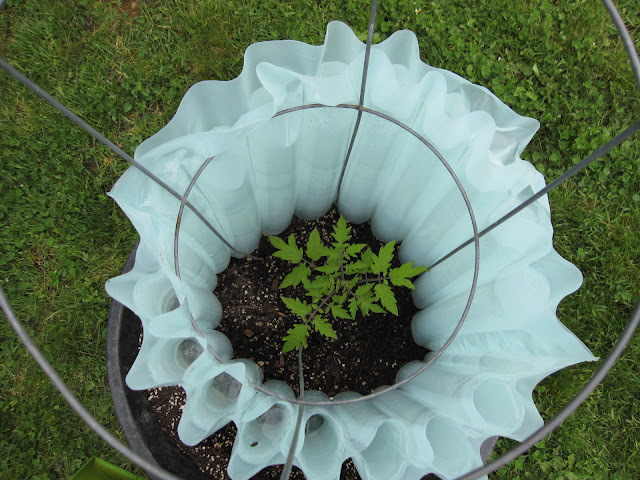 To go with the Square Foot bed, two tomatoes are planted in large plastic containers and are keeping warm with a Wall-o-Water. Doesn't this one look cozy? Rubarb is one of the few perennials in the vegetable garden beds. Potatoes are hilled up inside an old horizontal blind - there's a shoestring budget here so there are lots of good re-use tips for the public. Across the driveway from the demo garden are the Lane Family Gardens. This program provides a plot, seeds, seedlings, hand tools and expertise - all free - to help families in the community learn grow vegetables. I've been matched with a young family as their mentor, but honestly, they have more recent experience than me in vegetable gardening, so I'm more of a cheering section and backup waterer, so far. Here's the father of the family planting seeds in their plot a few weeks ago. I enjoyed his Roman reclining planting style. We planted out lettuce seedlings, and four kinds of beans. Yesterday, I checked on "our" plot. 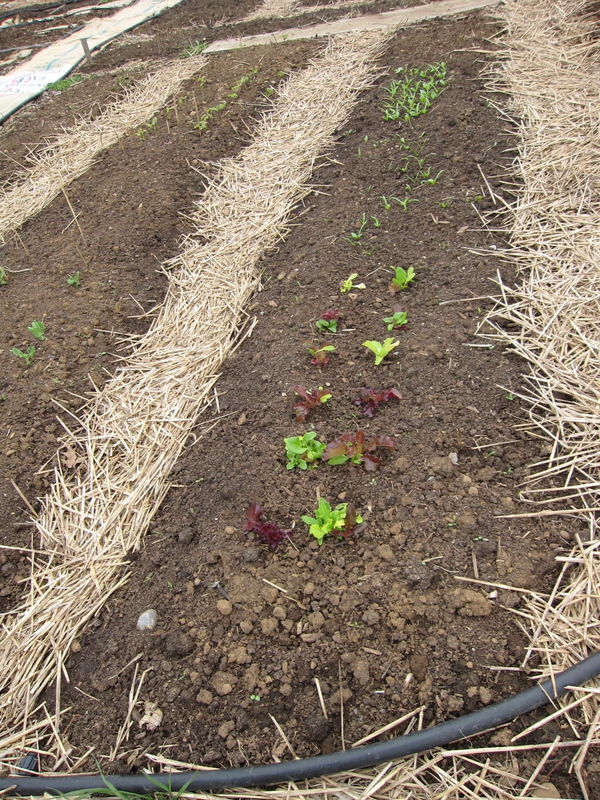 The lettuces are doing well, and lots of the seedlings have sprouted. We've been lucky with the rain and the family hasn't needed to do a lot of watering yet. Greenhouse 5 is the indoor base for both the activities I've been involved with, and the warmth inside has been a boon on these wet, cold Tuesday mornings. Inside, what initially looks like chaos is actually efficiently managed by the various users. Young basil seedlings wait for enough warmth to be planted out in the demonstration garden. Plastic-covered seeds stay moist to encourage sprouting. Sometimes a heat mat is used to warm them just enough to germinate. After the warmth of Greenhouse 5, the second thing that hits you when you enter is the intoxicating scent of lemons! This old lemon tree has obviously been here awhile and it smells heavenly this time of year. Last year, the Multnomah County Master Gardener Demonstration Garden produced over 1,100 pounds of food that was donated to food banks and Lane school. The garden is open to the public and staffed by MGs each Saturday morning from 9 to noon. If you're interested in seeing what and how they grow veggies, or have a question for a Master Gardener, stop by and chat with them. Veteran MGs have a lot of the answers, and we interns are working hard to learn and catch up to them. Happy Birthday, Longview Ranch gardens! 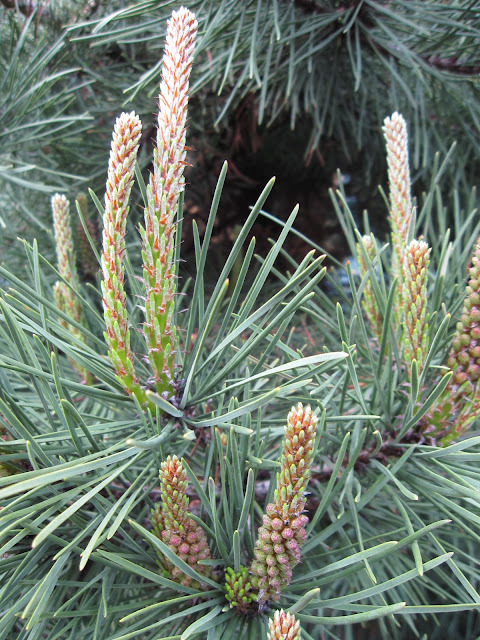 As I gazed at Pinus contorta candles yesterday, I realized it was the pines' birthday: three years ago they were nestled into the Northwest Territory here at Longview Ranch. Their "birthday" candles have increased almost twice their length in just the past few days. So, how about celebrating with some birthday flowers? Both this year's Abutilons are blooming. I know you Californians can grow them year-round, but here in Portland, I'm just happy I can grow Abutilons as annuals. I've been smitten since I saw a lovely rose-colored one in 2009 at my brother- and sister-in-law's garden in Altadena. This is 'Red Tiger'. Aren't those orange veins great? Lewisia cotyledon is just beginning to bloom. These little jewels need to be moved to a place I can more easily appreciate them. Helianthemum 'Henfield Brilliant" is rising to the challenge of its name. This will be quite a contrast, when the Ceanothus 'Victoria' you can just see budding on the left in this picture comes into bloom. ...and 'Sunset Red', whose flowers have always matured more yellow than red. Not that I'm complaining, you understand. Last spring I planted 150 Vinca minor starts around three big sidewalk trees. They took a lot of babying to stay moist (in spite of last year's cool, wet summer) but despite die-off from drying out and dog pee, about half pulled through and are starting to look like they'll survive. A few foliage plants are looking good, too. Here's a recent acquisition: Salvia argentea has the most irresistibly fuzzy leaves. I want to plant it in my front garden but I'm a little worried that it might suffer from too much fondling by passers by. I guarantee you would not be able to stop yourself from stroking this leaf. And it's just as soft as it looks. New vine maple foliage is the perfect green. And new huckleberry foliage is the perfect soft red. Since the past month has been a bust for a lot of backyard gardening due to the ongoing concrete chronicles (finally drawing to a close and soon to be documented here) I turned my gardening energy to enlarging my sunny south front garden bed. The Ceanothus had grown so much it was overpowering the size and shape of the existing bed: more grass had to come out! 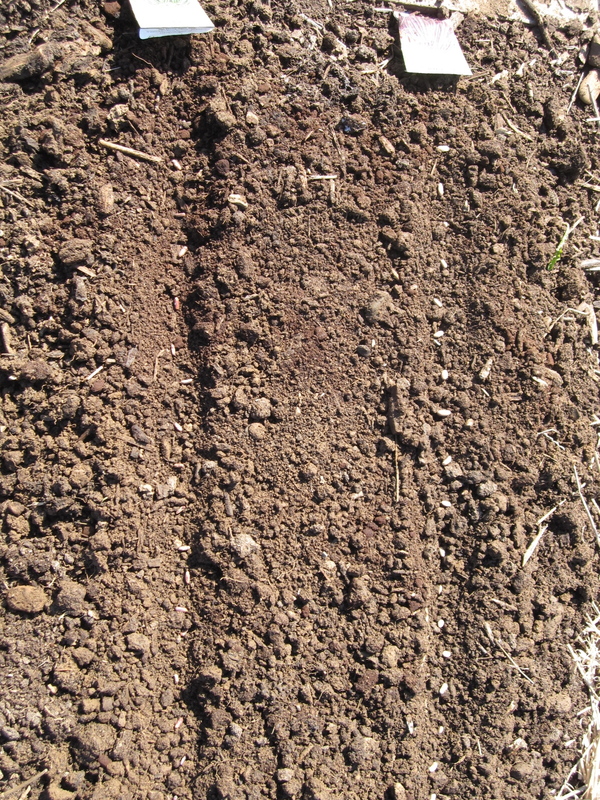 I have multiple plants ready to go in, but the soil is compacted and bad (read: clay) for most of my sun-lovers. Since each plant needs major additions of pumice and organic matter to the bed, it's taking major time and energy to do it right. You can just see three divisions of Crocosmia potsii 'Culzean Pink' at the top of the bed and an imperceptible Lagerstroemia 'Natchez' crape myrtle. Here's a closer picture of 'Natchez'. It's small now, but it's planned to take the place of the olive that died last winter by providing a little screening between the sidewalk and our dining room window. Last, for your foliage pleasure I present the happiest Eryngium I have ever had the pleasure to grow. 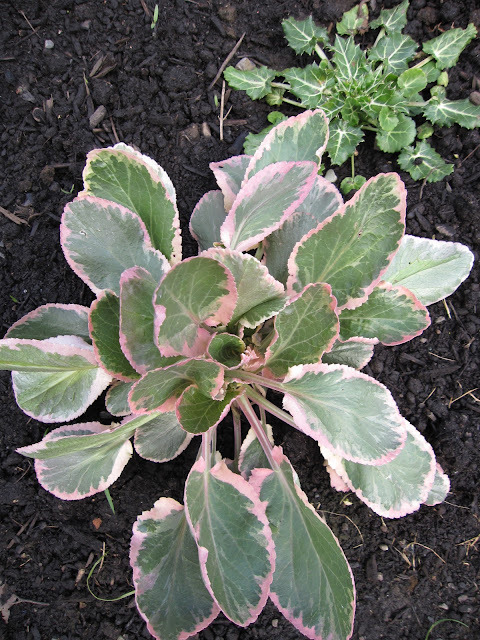 'Jade Frost' sailed through our last winter, and looked good doing it, I might add. This is the kind of birthday (and year-round) performer I need more of in the gardens at Longview Ranch.